The moon has never had all that much. It doesn't have atmosphere, it doesn't have water and it sure doesn't have life. What it does have, though, is dirt  lots and lots of dirt  and it's some of the coolest stuff you ever saw. 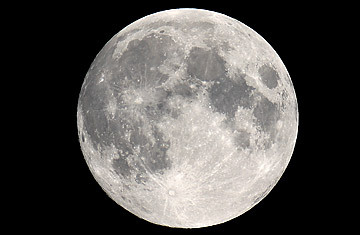 Now it's even cooler, thanks to the discovery this week of a wholly unexpected ingredient stirred into the lunar mix. Even before astronauts landed on the moon, they knew the soil would be something special. With no atmosphere to intercept incoming meteorites and micrometeorites, the lunar regolith  or surface covering  would have been subjected to a 4.5 billion year bombardment that would have produced a layer of dust far finer than confectioner's sugar. That dust, the Apollo crewmen found when they went out to play in it, did some strange things: it rose above the surface when disturbed and hung there far longer than could be explained by the moon's weak gravity; it crept deep into the weave and cracks of virtually anything it touched and clung there as if adhesively attached. What's more, it was filled with exquisitely fine green and orange glass beads  products of the superheated melting and cooling that followed impacts. When the astronauts brought their samples home, geologists in Houston discovered even more. The soil was unusually chemically reactive  not something that was expected from a scrap of a world that was supposed to be largely inert. And it did a lousy job of conducting heat. The surface of the moon on the sunlit side might be close to the boiling point of water, but just a few feet down it would be far below freezing. For 40 years, geologists struggled to understand just what gave lunar soil its pixie-dust properties. Geologist Marek Zbik of Queensland University of Technology in Brisbane, Australia, may finally have cracked it. The answer: nanoparticles  vanishingly tiny flecks of mass, some no bigger than molecules, that have all the odd qualities of moondust and more. Zbik made his discovery thanks to an instrument known as a synchrotron-based nano tomograph  a hunk of hardware that didn't remotely exist when the Apollo crews splashed down. Nano tomographs work by bombarding nanoparticles with X-rays to produce 3-D images of structures that otherwise would be far too tiny to see  or at least to see well. When Zbik got some lunar soil and a nano tomograph in the same room together, he knew that the first thing he wanted to look at were the infinitesimal glass bubbles in the lunar material. The bubbles are formed the same way the larger glass beads are formed  in the fiery heat of meteorite collisions  but their exotic origins notwithstanding, they still ought to be built like any other bubble. That means they ought to be filled with some kind of gas. That, however, wasn't the case. "Instead of gas or vapor," says Zbik, "the lunar bubbles were filled with a highly porous network of alien-looking glassy particles that span the bubbles' interior." Alien-looking maybe, but Zbik quickly recognized them as nanoparticles  and that would explain a lot. Nanoparticles can become electrostatically charged, which would impart the same property to the soil, perfectly accounting for its tendency to float. They have low thermal conductivity, explaining why the lunar subsoil can get so cold so close to the surface. They are chemically active, and they are also electrically sticky, meaning that when the soil got on an astronaut's pressure suit or into the joints of his lunar tools, it would be all but impossible to brush away. What was not immediately evident was why the nanoparticles had a chance to interact with the soil at all. The ones that were spotted by the tomograph, after all, were sealed inside the bubbles like a figurine in a snow globe. Something would have to be breaking those globes, and Zbik reckons it was the same thing that created them in the first place: collisions. "It appears that the nanoparticles are formed inside bubbles of molten rocks when meteorites hit the lunar surface," he says. "Then they are released when the glass bubbles are pulverized by the consequent bombardment of [more] meteorites. This continuous pulverizing ... and constant mixing develop a type of soil which is unknown on Earth." There's more than just abstruse soil science in all this. Nanoparticles have long been the It material for engineers working on new computer hardware, medical equipment, drug-delivery systems, even fabric. The better we understand their origins and properties, the better we can manipulate them. What's more, if we ever hope to establish a long-term human presence on the moon, the tendency of the soil to cling to surfaces and, ultimately, to wear them away is a problem that will have to be addressed. Studying the dust now can provide solutions for later. That, however, is for another time. For now it's enough just to appreciate the elegance of both the new discovery and the moon itself. Four decades after we last dropped by for a visit, our little satellite is still surprising us.